2012 - We were so pleased to acquire work from Laura Lee Eagles last year at Idex 2011. We don't sell many babies but her work is really great. 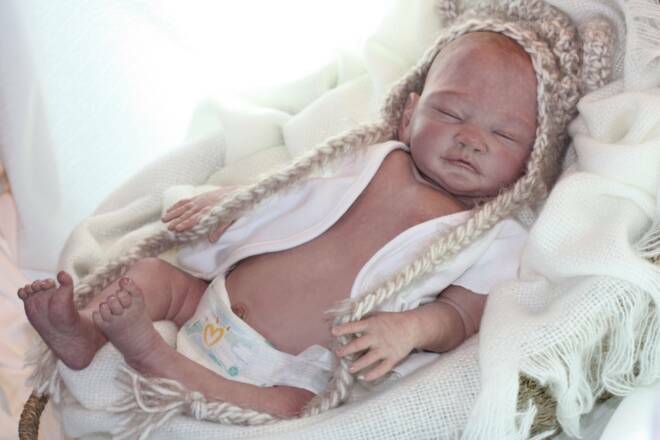 This Canadian artist has mainly worked on smaller dolls under 10 inches for quite some time. In 2011 at Idex she debuted her new 20" plus larger size dolls. We thought they were excellent and couldn't resist Baby Feron shown below. Then Laura did another one of a kind for our show in October which sold very quickly. This year(2012) - Laura did not even attend Idex as an exhibitor as the demand for her work is so great she can not even keep up with it. We did see her there as a guest and she has promised us more work very soon for 2012 so be sure to get on our email list for automatic notification of her work the minute we get it! She is hto! Using all her love and imagination, Laura Lee sculpts her Peapod Babies individually using Polymer clay. No molds are ever used. Her babies have her own one-of-a-kind soft bodies filled with Polly pellets and Polly fiber fill to weight the body just like a real baby. 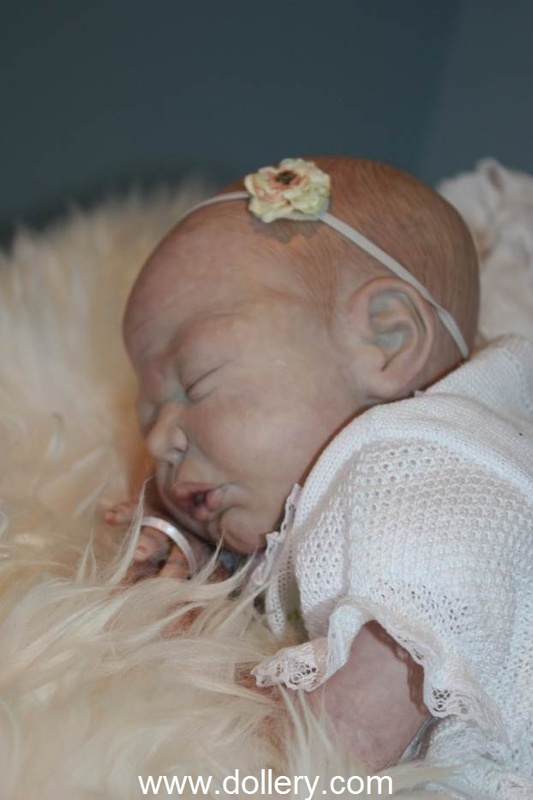 She makes life-size, preemies, mini babies with pose-able limbs, full sculpts and full sculpts with pose-able limbs. She paints each one softly with a mixture of heat paints which is applied in layers to bring the baby to life. All their tiny toes and nails are glazed and manicured to give the look of real baby nails. She dresses each baby in one-of-a-kind layettes. Each comes with a "birth certificate" with all the baby's information and a signed Peapod's Nursery card. 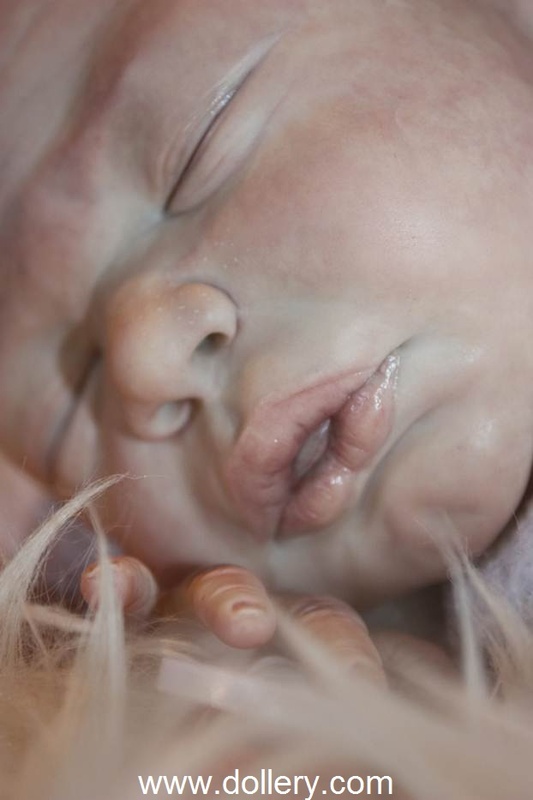 Closed eyed newborn baby girl named Sailor is 19 inches long (48cm). Head circumference 13" (33cm). She has hand painted hair and comes in the gorgeous white knit Will Beth layette in the photo. Signed photo Certificate is included. Soft Doe suede body filled with silicone pellets and polly fill for a nice weighted feel , full sculpted legs , 3/4 sculpted arms, hand painted hair ( Coming home with baby ) Will Beth white knit Dress, diaper pant, booties flower head band , pamper, white onesie, birth certificate and receiving blanket and plush toy. Peeking eye newborn baby girl is named Krin she is 19 inches long (48cm). She has hand painted hair and comes with the gorgeous white knit Will Beth layette she is wearing in the photo. Signed photo Certificate included. 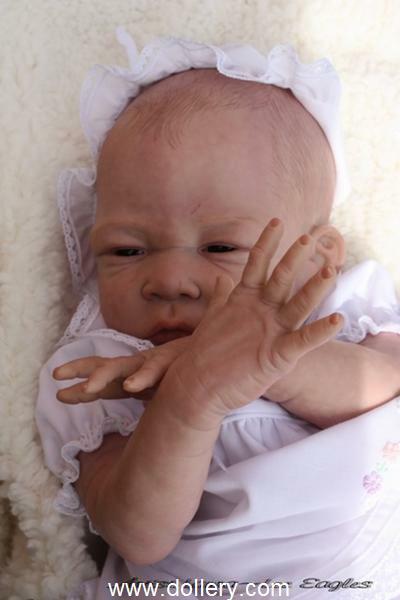 OOAK baby Krin (peeking eyes blue/Gray ) 19” (48cm) inches long, Head Cert: 13” (33cm). Soft Doe suede body filled with silicone pellets and polly fill for a nice weighted feel , full sculpted legs 3/4 sculpted arms ,hand painted hair ( Coming home with baby ) Will Beth white knit Dress, diaper pant, booties flower head, pamper, white onesie ,band, birth certificate and receiving blanket and plush toy. 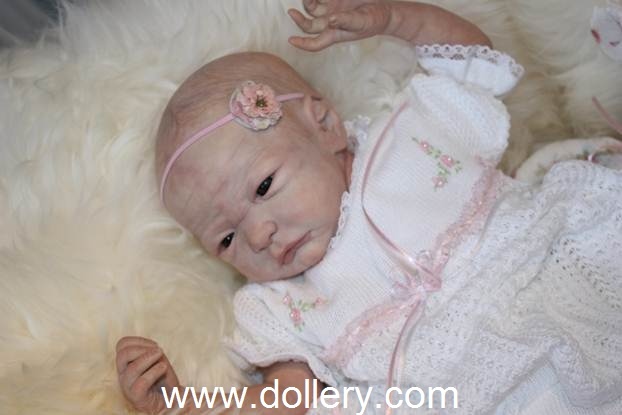 OOAK Baby Dolls!, “Baby Olivia” - SOLD - Email us at kmalone@dollery.com to make sure you go on our waitlist for her work and we can notify you automatically. *Comes complete as shown with both outfits featured here. Bear & lamb blanket not included. “Baby Olivia” is so adorable. We were very lucky to get her for our show as Laura has been really busy making sculpts for her reborn kits and silicone editions. She started sculpting for Ashton Drake a couple years ago as well so there is a long, long waitlist right now for her work. 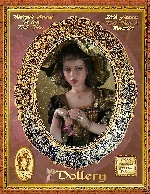 Collectors take note - these are her true original one-of-a-kind dolls and she has very few available now at all. Now is the time to grab one of her originals before you just can’t get them! This little cutie has hand painted hair, open fingers and slightly bent legs. She comes with both outfits shown. 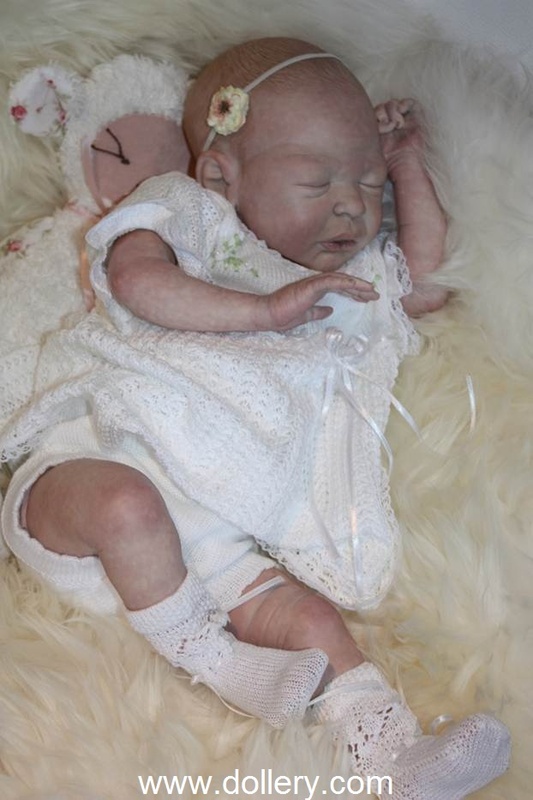 Laura is the best baby doll artist we have seen in a long time. Sure bet. One-of-Kind, 20", comes with detachable breast/tummy plate.